I started "Sergei" a week or so ago. 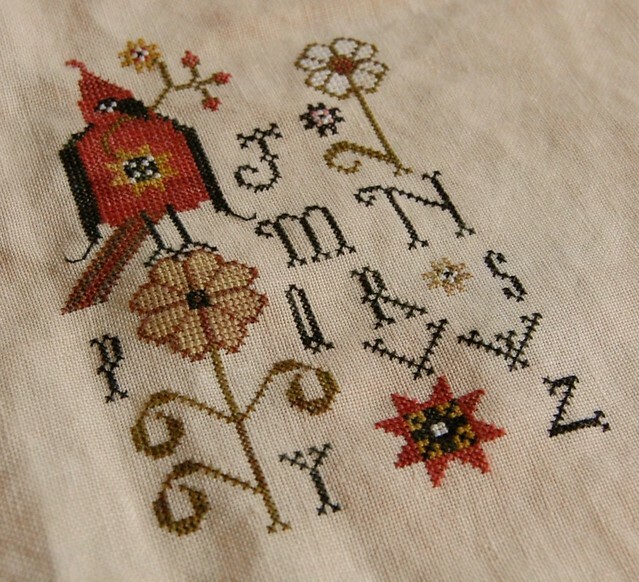 I just love this design by Plum Street Samplers. I'm a little over halfway finished with it now. 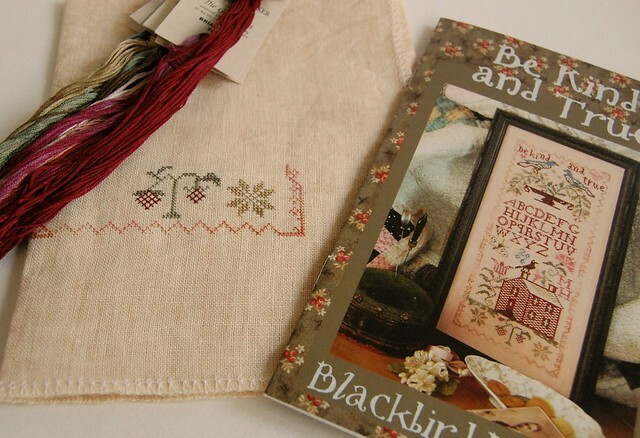 My other start is "Be Kind and True" by Blackbird Designs. I've been wanting to stitch this one for awhile now. I don't have a lot to show, but I plan to get back to it after I've finished Sergei. As far as future starts go, I've been thinking a lot about Christmas Garden after seeing so many wonderful starts around the blogs. I was thinking of stitching it on 40 ct. using Belle Soie. 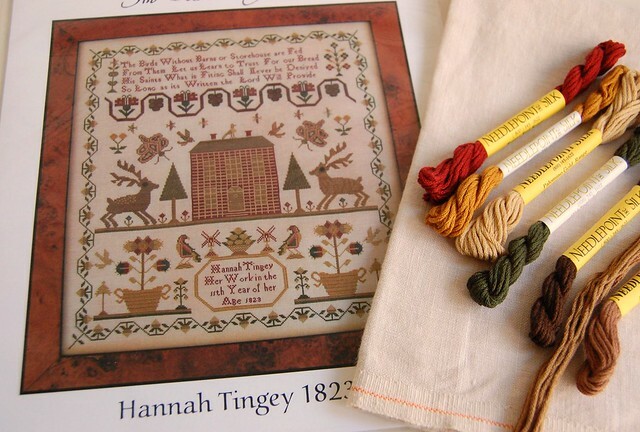 Another wonderful design that I really want to start is The Scarlett House's "Hannah Tingey 1823." Tanya was stitching this in Myrtle Beach and it's just gorgeous!! I want to finish up Sarah Elizabeth Brooke before I start another big sampler though. I think I'm starting to become more of a one-at-a-time kind of stitcher. I get overwhelmed when I have a lot of WIPs. I went through my stash yesterday and unkitted a lot of things - including some UFO's I knew I'd never finish. I got my little stash closet organized and it feels so good. Like I have a fresh start for the new year. You've picked wonderful new starts and I'm going to enjoy watching your progress on Christmas Garden. Love your pieces! Sergei was such a fun stitch, wasn't he. Look forward to seeing progress on all of your beautiful pieces. sergei is so cool! love all of the stitching, and your future starts are nice too! I love your starts and plans for starts. Sergi looks so good. I may have to hunt him up myself. Love your new starts! Good for you for getting organized too. Ooohhhh.....love all of your choices! Your starts are looking wonderful. Ooooooh! I love your stitching and your plans, Nicole! Sergei & Be Kind & True are both fantastic--nice progress! 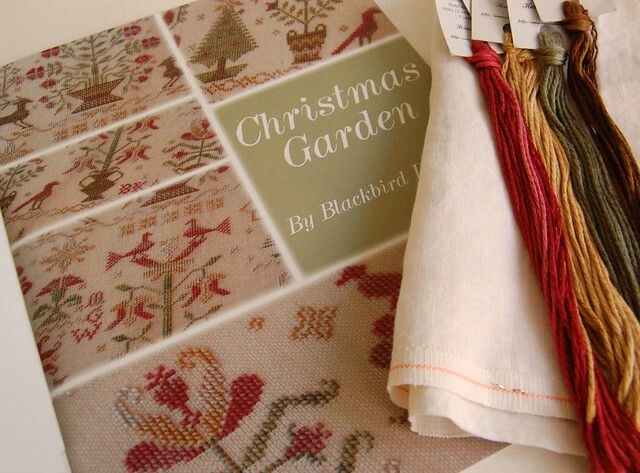 Love your Christmas Garden plans, too! I am trying SO hard to not start it asap but man--it is so pretty! Yay for a fresh start to a new year. I really think I prefer being a one at a time stitcher too. All these WIPs are stressing me out! Love Sergei and your new BBD start. I think both Hannah and Christmas Garden are going to be gorgeous - it's funny how similar their color palettes are though! Sergei is looking good, your new start plans are all really nice and I look forward to seeing your progress on them. Hey, Girlfriend! So good to "see" you! All your starts look fantastic, of course some of my faves. I checked to see if the Sale page was updated after your cleaning spree... :-) Big hugs! Love the colors on all of those projects. Looking forward to kitting and starting Christmas Garden sometime later in the year. I'm more of a one at a time stitcher too. Too many projects make me a frazzled mess! I just wish I could stitch faster. I love Sergei..wonderful progress and plans for the rest of the year too! Your new start is gorgeous!! You have chosen some lovely projects! Beautiful starts Nicole, look forward to seeing your progress and finishing. I love both of your current stitching projects and the ones you plan to stitch in the future! Beautiful WIPs, Sergei is so handsome. I love the Belle Soie you've picked out for Christmas Garden. You have some wonderful designs lined up! look forward to all the progress. Love Sergei. I just love your BBD start, and Sergei is the cutest! you have some great sampler choices set up. have a great weekend. Wonderful projects Nicole! I love them all. Your Sergei looks really good. Some wonderful new starts planned there as well. I'm just LOVIN' your stitching progress! Great projects to start. I did a clean out of my stash trunk right before Christmas. Felt good, like I could focus on what projects to start. You have some wonderful projects there. Looking forward to seeing the progress you make on them through the year. Gorgeous projects. Sergei looks great and so does your start on Be Kind and True. Love your choices for Christmas Garden. Good for you to find a way to keep the pleasure in. I tend to have only few projects going and find that this is for me the most pleasant way. your start on Sergei is gorgeous! I have Boris and Olga hanging in my house, and waiting for Sergei's chart to arrive. and the plans are great, too! Seems like everyone is stitching Sergei or Christmas Garden...or both! Sergei is really cute. I have started Christmas Garden, but switched to something else today...I am still looking at my color choices with a critical eye. Most of my friends are switching to Belle Soie. Happy stitching on your great selections. You have some wonderful projects you are planning on starting. I particularly love the Christmas Garden.